Richard Schofield was born December 7, 1949 in Glendale, California. He is a veteran of the US Air Force having served from 1969 to 1976 which were trying times given that these were some of the most dangerous years of the Vietnam War. A business owner and family man Rick continues to call California home. Rick served as ALPCA Vice President 1974 - 1975 and 1987 - 1988. He was a candidate for Director in 1988. His collecting interests consist of state runs from all fifty states and DC runs of Canada and collecting plates worldwide. His particular specialty and expertise is in Nevada plates. Rick served as Vice President and President of the Southern California region and as Vice President of the Nevada region. National conventions have been the venue for some of the most creative displays built by Rick. His seeming endless knowledge of things obscure has been an asset to new and old collectors alike due to Rick's willingness to share and instruct. In the decade long history of the Hall of Fame Rick is the only person to have received nominations from three club past presidents. That alone is testimony to his dedication to the hobby and the club and the respect members have for him. One of his nominators went so far as to label Rick as the gold standard of license plate collectors. 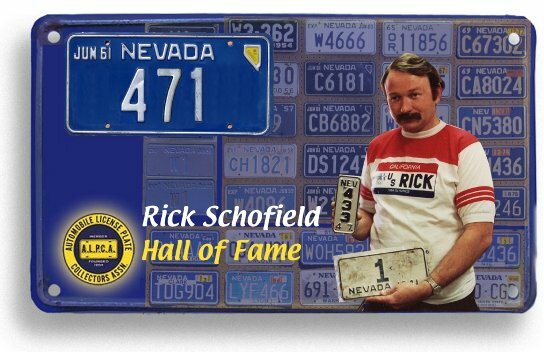 So in the words of many, we welcome Rick Schofield the "gold standard of plate collectors" to the ALPCA Hall of Fame.